It’s been said that money cannot buy happiness. But how a person manages their money has a huge impact on their life in the form of what opportunities are available to them as they progress through the years. The amount of money a person has can affect their education, where they live, the healthcare available to them, and ultimately how they spend their final years. Major financial decisions require careful thought and analysis. For example, buying a too expensive of a house can affect a person’s budget for 30 years. Many people depend upon professionals such as accountants, loan professionals, and even financial planners to help them make the right decision. While getting professional advice is never a bad idea, there are simple, free tools available that can help a person not only make sound financial decisions, but also effectively plan for the future. 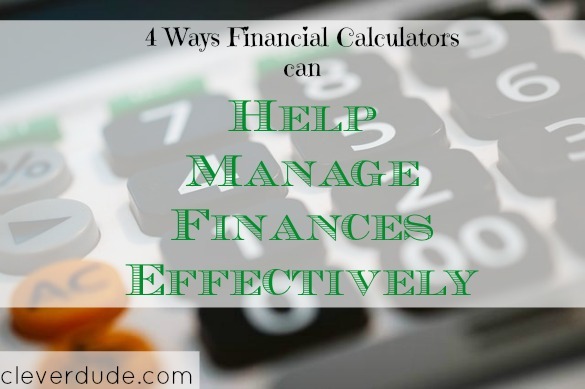 Financial calculators are a valuable tool that can help people manage their finances. Interest is Complicated : There are many people that do not know how compound interest works. Incorrectly calculating the interest added to a balance, whether it’s on debt or investments, will provide an incorrect result. Financial calculators have been programmed with the right algorithms for compound interest. Manual Calculations are Error Prone : When I do any semi-complicated arithmetic calculation, I do it several times to ensure I get the same answer. I do this because I commonly press a wrong button, or skip a number or make some mistake. That problem doesn’t exist with financial calculators. They produce the right answer every time. Easily Run Different Scenarios : In many situations, a person may want to run different scenarios just to see how the numbers work out. For example, what is my monthly payment on a 200K house with a 30 year mortgage and a 5% interest rate vs. a 15 year mortgage with a 4% interest rate? With a financial calculator gathering this information is as easy as pressing a few buttons. Financial calculators can be found with a simple search of the internet and one exists to help people with financial planning, or with many of life’s major financial decisions. For most people, buying a home is the most expensive thing they will ever buy. It will likely be the centerpiece of the budget for many years, so it’s imperative for their financial health to take things slow, contemplate all the options, and make the right decision for their specific situation. Make the right choice, and the mortgage payment is made with ease with plenty of room left in the budget for the rest of life’s necessities while building equity in the home. Make the wrong choice, and that same person could struggle financially for years, and even be forced into a foreclosure situation taking years to recover from. A mortgage calculator can help a person with this very important decision. Mortgage calculators typically have users enter the mortgage amount, the length of the mortgage, and the interest rate. With a click of a button, you’ll see your estimated monthly mortgage payment. Many mortgage calculators will also build the amortization schedule, which shows users how much of each payment will be applied to the loan principal, and how much goes towards interest. It should also show how much interest would be paid over the life of the loan. A mortgage calculator allows a person to easily run as many scenarios as they want with different home prices, interest rates, and mortgage lengths. This information will be invaluable in helping a prospective homeowner make the right decision for their financial future. Everyone needs a mode of transportation, and while public transportation is an option for some, most people will purchase a car. The vast majority of people will finance a car at some point in their lives. Dealerships like to shuffle you right from the lot to a salesperson’s office directly to their finance person. One of the favorite tricks of auto loan finance agents is to extend the term of the loan to make your monthly payment more affordable. Feeling like they’ve already invested hours in the process many customers cave in and purchase a vehicle with unfavorable terms and long lasting financial impacts. The smart thing to do is to shop around, and weigh your options carefully at home without anyone pressuring you. A good auto loan calculator will have a mode that allows you to enter the the monthly payment you can afford, the length of the loan you’re comfortable with, and the current interest rate. It will then calculate the maximum price of the vehicle you can afford. This allows car shoppers to know whether a vehicle is affordable before allowing the salesperson to talk them into talking to a finance person to, “see what they can do.” If the price is over the calculated amount, the vehicle is flat out unaffordable. The primary financial goal should be to eliminate any debt, especially high interest credit card debt. It’s a well known fact that if only the monthly minimum payment is made, it will take years to completely pay of the balance. If you don’t have a plan to pay off your debt, you need one. A debt repayment calculator can help you formulate a plan to get out of debt. By entering the amount of your debt, the interest rate and how much is paid each month, the calculator will tell you how long it will take you to get out of debt. You can then play with the calculator, trying different monthly payment values to see how it affects the speed of debt repayment. Using a debt repayment calculator, along with a detailed budget showing how much can be applied towards the debt, a person can accurately determine when they will be out of debt, and make financial decisions and other life plans accordingly. If a person finds that they just cannot get a handle on their debt on their own, it may be time to consider professional debt relief help. Contribution Calculator : Given the amount you want to have when you retire, by filling other information the calculator will estimate how much you need to contribute each month to achieve your goal. Retirement Age Balance Calculator : Given your current monthly contribution and other information the tool will estimate what your investments will be worth at retirement age. Users can change the rate of return, or the annual contribution rate to get the retirement number they desire. You can then use that information to determine if you are on course to be ready for retirement. If not, the calculator can also be used to determine what you need to do to get back on track. One of my favorite mortgage calculators is from Bankrate.com. The base calculator is simple to use, and it allows the user to get more detailed information, like the amortization schedule, by clicking a button. The auto loan calculator from USAA couldn’t be easier to use, and has two modes. Users can either enter the budgeted payment information and get the maximum affordable price, or given the price of a vehicle the monthly payment can be calculated. The unique slider feature included with the debt repayment calculator from The Simple Dollar lets users easily change the monthly payment amount and instantly see how it affects the debt free date. I really like the graph displayed in the retirement calculator from Bloomberg showing the rate of growth through time. Financial calculators are a free tool that people can use to help manage their financial lives more effectively. Whether the goal is to pay off debt, save for the future, or finance a large purchase, there’s a calculator that can help you make the best decision for your budget and your financial health. How about you Clever Friends, do you use financial calculators? Which one is your favorite? Financial calculators first of all will create fear about the figures that we might need for retirement as that will shatter all our plans we will have on retirement and thus will be really helpful for the people to plan things effectively. I have used basic interest calculators, like the one on investor.gov. This is a good list for specific purposes, though. Thanks! My favorite retirement calculator is FIRECalc. Being able to add in all variables beyond rate of return expectations is necessary to get a good result. @Raj – They definitely could “shock” a person into action! Thanks for stopping by, Raj! @Emily – thanks for the pointer…..glad I could point you at some more specific calculators! @LeisureFreak Tommy – Thanks for the pointer, I’ll have to check it out! I love retirement planning calculators. I felt so much better about the future after running my numbers through there and making a few adjustments in both directions to see if I could retire early if things went well or what the bare minimum I could put away and still be ok with in reverse was. @Mel – good point….not only can calculators help you plan, but can also validate that you’re right on track!